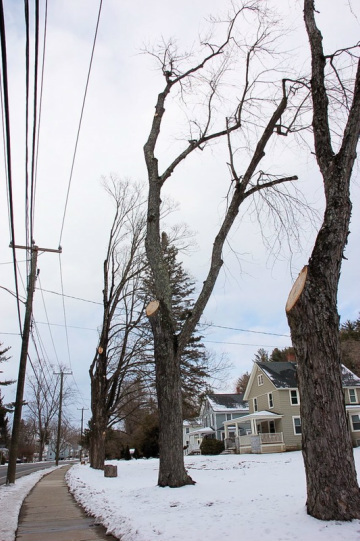 New tree-trimming standards proposed by United Illuminating and CT Light & Power give them the authority to remove or severely cut back all “tall growing trees” and overhanging limbs” within eight feet of utility lines, even if they’re healthy and not endangering the lines! Visit the Garden Club of New Haven to see what could happen outside your front door, and read these comments from Hamden residents living in neighborhoods already feeling the effects of the utilities’ pilot program. Street trees shade our sidewalks and yards, clean our air, protect from erosion, and beautify our neighborhoods. We should protect them, not cut them down. Rather than the overly aggressive, rigid, and one-size-fits-all “Enhanced Tree Trimming” approach, the Public Utility Regulatory Authority should require CL&P and UI to follow the prudent recommendations of the State Vegetation Management Task Force. Public meetings will be held this Wednesday and Thursday. Please come speak up for our trees! If you can’t make the meetings, you can send written comments to PURA. Please send them this week or as soon as you can. Written comment should include a reference to Docket No. 12-01-10, and can be emailed to PURA.executivesecretary@ct.gov and Nicholas.Neelay@ct.gov or mailed to PURA, 10 Franklin Square, New Britain, CT 06051. Please send us a copy too at LMcMillian@ctenvironment.org. Thank you! Posted by Tyler Archer, Outreach Fellow for CFE/Save the Sound. Cover Images: Google Maps (Left) and Tom Zetterstrom (Right).